Moviegoers have been waiting with bated breath for the premiere of Marvel's Avengers: Infinity War, perhaps the ultimate superhero showdown ever to grace the silver screen. No doubt many fans will be inspired to host themed parties based on the film. 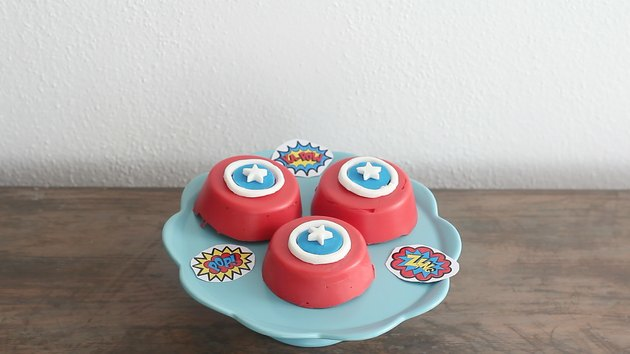 Of course, you can't just serve plain old party food–you must serve something truly worthy of superhuman status. 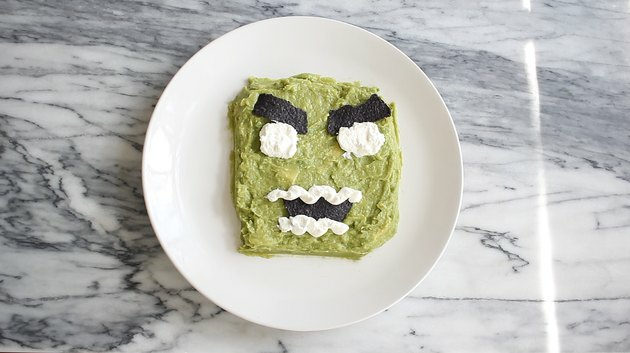 To help you entertain with ease, we've whipped up five festively fun and kid-friendly dishes that pay proper homage to the characters from the movie that we also think mere mortals will find incredibly delicious. 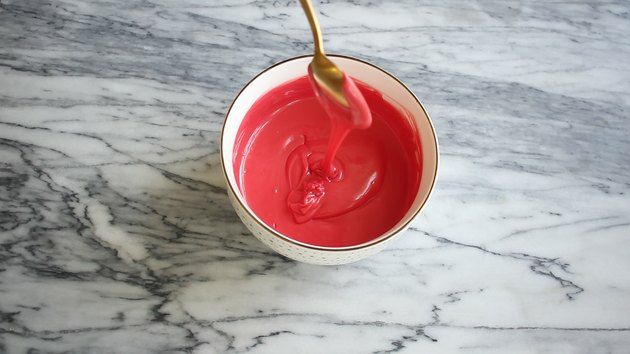 Place the red melting chocolate in a microwave-safe bowl and nuke for 30 seconds. Stir and nuke again in 15-second increments until completely melted. Coat the bottom of each hole in a muffin pan or cookie mold with the melted red chocolate and spread evenly to create a smooth layer about 1/4" thick. Tap and shake the pan to remove any air bubbles. Allow the chocolate to harden, about five minutes, before placing an Oreo cookie on top of each hole. 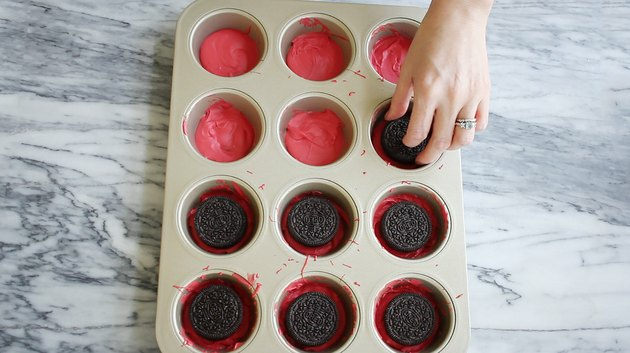 Put the remaining melted red chocolate in a piping bag (or freezer bag with the end snipped) and pipe first around the sides and then top of each Oreo to completely cover the cookies. Again, tap and shake the pan to remove any air bubbles and then place it in the freezer for ten minutes. While the cookies are in the freezer, roll out some white fondant and blue fondant. Use mini cookie cutters to cut out small circles from the white fondant, as well as tiny stars. Then use a smaller circle cutter (we actually used a water bottle cap) to hollow out the center of the circles so that they form white rings. 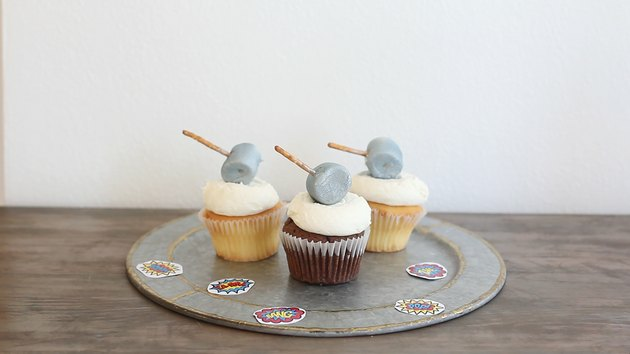 Use the same smaller circle cutter (or bottle cap) to cut out circles from the blue fondant. Remove the cookies from the freezer, and assemble the fondant circles and stars on top of each cookie, using a tiny bit of melted chocolate to adhere the shapes securely. 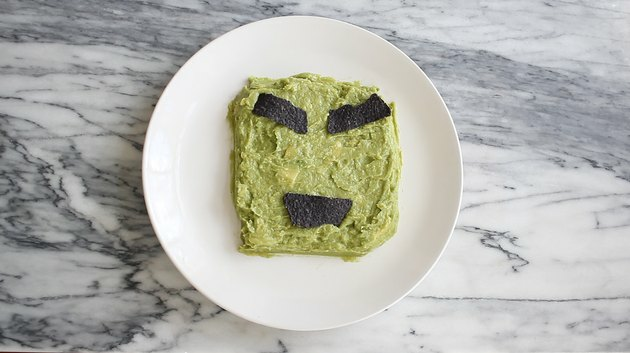 Scoop about a cup of guacamole onto the center of a plate and then use a fork to smooth and shape it into a square. 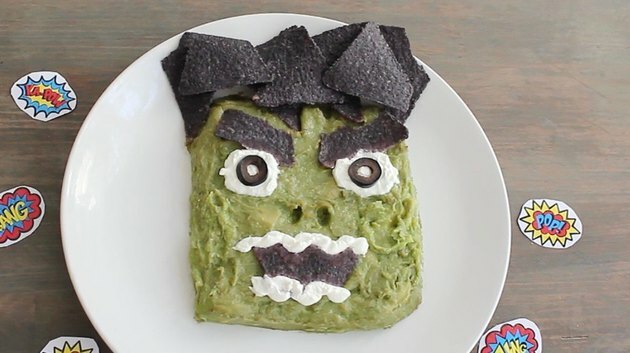 Break off the ends from three blue corn tortilla chips and place them on top to form the eyebrows and mouth. You'll want to angle the eyebrows pointing down and inward toward each other. 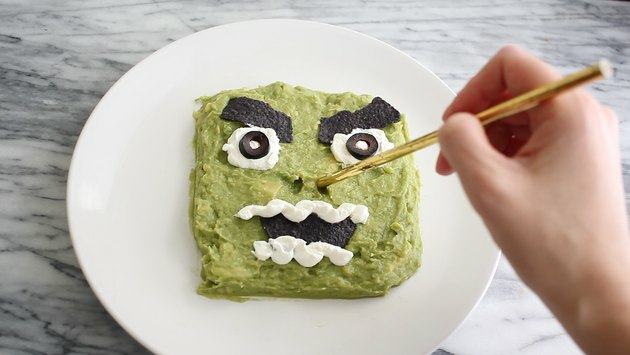 Place sour cream in a piping bag and pipe round-shaped eyes underneath the eyebrows and zigzag/squiggly lines on the top and bottom of the mouth to form teeth. Place sliced black olives on top of each eye and use a straw or toothpick to form the nostrils. Place more tortilla chips at the top of the head to form the hair. 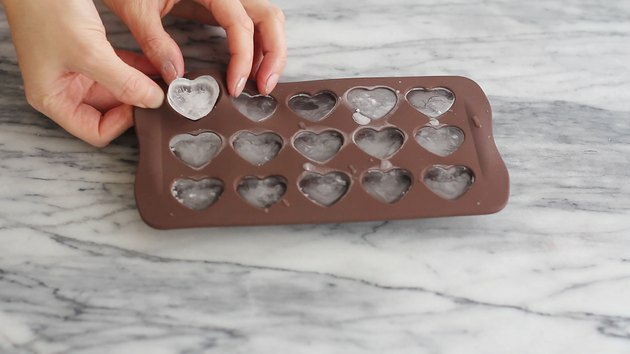 Freeze water in a heart-shaped ice cube tray or silicone candy mold. 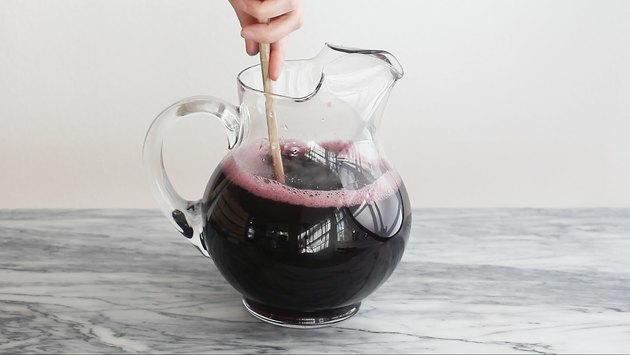 Place 3/4 cup blackberries and 1/4 cup mint leaves into a pitcher and use a wooden spoon to muddle them together. Pour the grape juice, pineapple juice and ginger ale into the pitcher and stir. 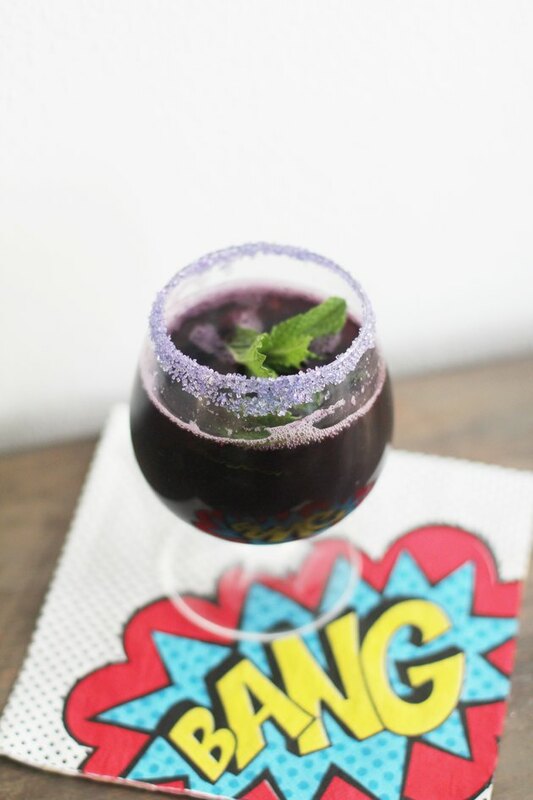 Rub a lemon wedge around the rim of a glass and then dip the rim in purple sugar to coat it. 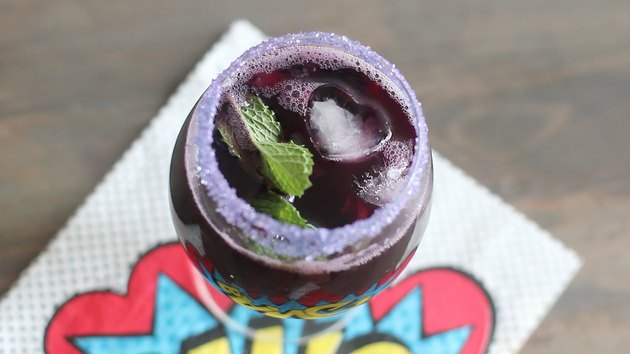 Place several heart-shaped ice cubes into the glass, fill with punch and garnish with fresh mint leaves. 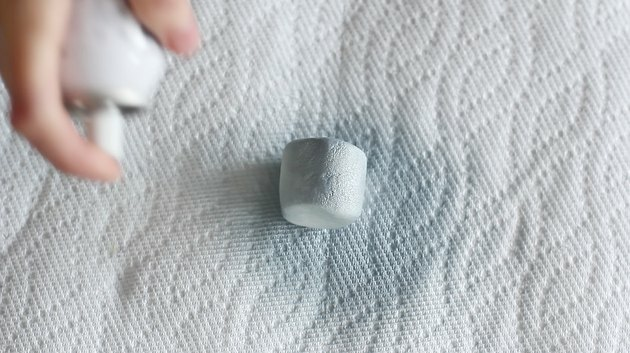 Place a paper towel down to protect your work surface and place the marshmallows on top. Spray each with edible silver spray paint until evenly coated. Wait five minutes or so for the paint to dry. 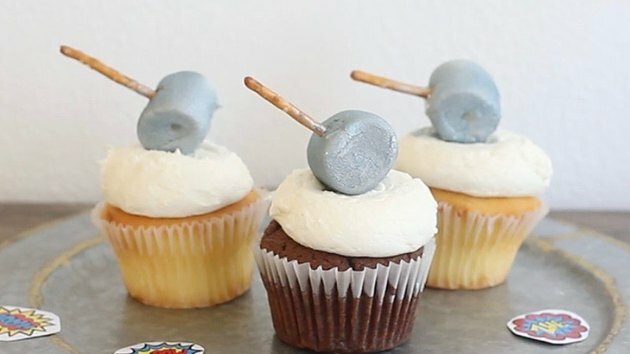 Insert a pretzel stick into the center of each marshmallow and place each "hammer" on top of a frosted cupcake. 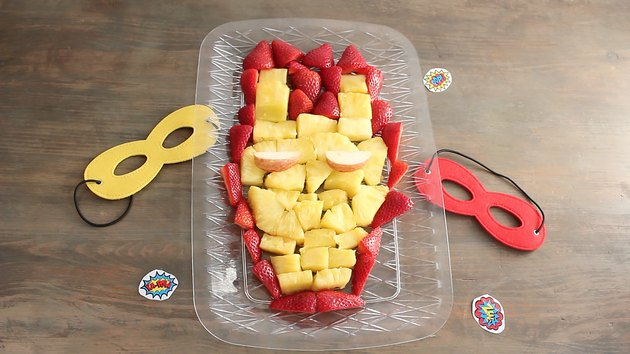 Arrange the pineapple on a large platter or plate to form the shape of Iron Man's mask. You'll want the face shape to taper in towards the jawline. You'll likely need to custom slice a few pieces to get the right shape. 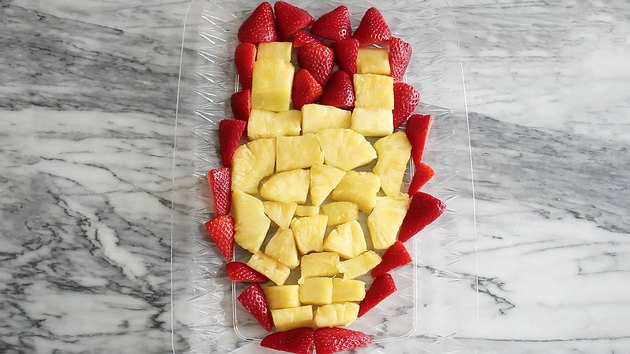 Place full-sized strawberries around the top of the head and then sliced strawberries around the sides and bottom. Cut two apple slices and place them on top of the pineapple to form the glowing eyes. 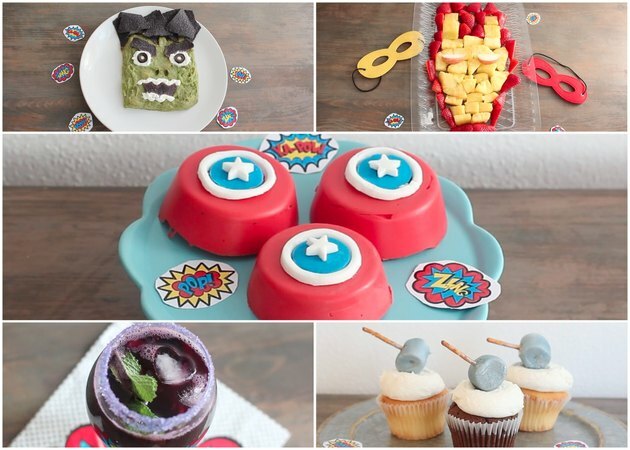 You now have the perfect treats for any superhero-packed celebration!